Germany's long and storied history is tightly linked to its many waterways... most travelogues from Germany in this website are from riverside towns and cities. The larger rivers, like the Rhein and Danube, are loaded with big cities. But its the smaller rivers that one should seek out, as they tend to host a dozen to a hundred charming little hamlets with all the small town cheer and friendliness that makes them memorable. Plus, at each bend, there are often castles or castle ruins to complete the scenery. Following a stretch of river road, jumping from town to town and castle to castle, is a great way to spend a Sunday in Germany. The Burgenstrasse, or Castle Street, is one such route you must take if you have the chance. It is a series of roads stretching from Mannheim to Prague, following the Neckar, Main, and Vltava Rivers plus various canals in between. But the best stretch is the Neckartal (Neckar Valley) between Heidelberg and Heilbronn, where the valley is steep and windy, the castles are many, and the towns are beautiful and spaced out every few kilometers. 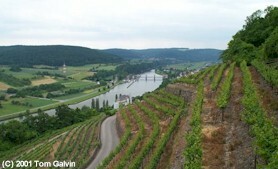 It is also part of Germany's wine country, and vineyards are plentiful. This travelogue introduces four towns and their castles in the Neckartal -- Hirschhorn, Eberbach, Neckarzimmern, and Gundelsheim. Other towns on the Neckartal that have been given their own page are Neckargemuend and Bad Wimpfen. Hirschhorn -- The second photo shows the town of Hirschhorn and its Castle above (both of which are actually just across the border in Hessen, not Baden-Wuerttemburg, but that's just a minor detail ;-D ). Of the four towns here, this is the one that catches your eye the most as the precariously-positioned Castle directly faces you as you drive south. The Neckar River is just off the photo to the right. Clearly visible in the photo is the city wall, much of which is still intact and protects the colorful inner city. Given the Neckar's pension for flooding despite the many well-positioned locks, the wall has had its share of use. There is one main street that bisects the downtown, leading to the beautiful Protestant Church and town hall in the market square. This square lies at the base of the climb to a Catholic church and convent before reaching the castle. The castle is now a famous four-star restaurant and hotel. Several of my compatriots have taken their wives or dates there for a wonderfully romantic evening! Eberbach -- I'm cheating a bit on this one because I've been there six times and amazingly enough I've never taken a photo of it. But, while on a winter train ride I did take the third photo where a bit of Eberbach can be seen in the background. It will have to do for now. Eberbach is another very pretty town located down B27 from Hirschhorn. It's most striking feature is its long wharf and riverfront, as it occupies a long southward bend. The old city follows the outside of the bend, marked with several medieval towers at the ends of the city and a classic old marketsquare and beautiful church. The inside of the bend rises gradually and many newer houses and neighborhoods dot along the countryside. This town is very old fashioned, and when I take visitors on a drive along the Neckartal, I have often stopped in one of its friendly guesthouses for a huge schnitzel. Eberbach doesn't have its own castle, but there are several nearby, the biggest being in the adjacent town of Zwingenberg. Nope, don't have a photo of that one, either. Neckarzimmern -- You will definitely want to stop off at Neckarzimmern. The town is very pretty, nestled up against a ridgeline following a wide bend in the Neckar. It is also very tourist-oriented, with a lot of restaurants and shops. In fact, there are s everal major glass-blowing factories in the area, some of which have studios open on Sundays (unusual for Germany). 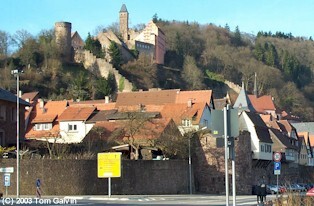 But by far the major attraction in Neckarzimmern is the Burg Hornberg Castle (shown in the fourth photo). This old castle has several things going-on. 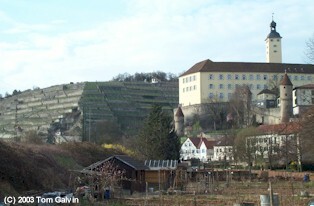 First, it is a prominent vineyard (the first photo shows the vineyard more directly) and weinstube. When you enter the gate, the weinstube entrance faces you. Inside is a combination wine store and museum as you get to see winemaking equipment and look over (and possible sample) a wide variety of regional wines. The weinstube doubles as a ticket office for tours inside the castle itself. For the most part, the interior is simple stone with little of its decor remaining, but the ability to climb to the tops of the various towers and vantage points is clearly worth it. Finally, the Burg has a wonderfully classy restaurant and observation deck. Twice I have visited the Burg and found the restaurant closed for a wedding reception -- which makes sense, what better place to celebrate romance than at a castle, eh? Gundelsheim -- This is next town south from Neckarzimmern, and just about the last before Bad Wimpfen. The fifth and final photo shows you some of its best sights. First is the rather huge 16th Century Schloss Horneck with its medieval towers. This palace has been completely restored now, and serves as a museum. Second is the unusual terraced vineyard. Most of Germany's vineyards conformed to the natural landscape (like the one of Neckarzimmern in the first photo), but not this one. The Schloss Horneck is one of two palaces in the area -- the other is the Burg Guttenberg on an adjacent hilltop, barely visible from the road. 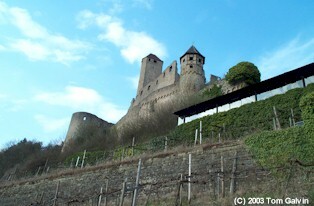 That fortress is on an isolated hilltop, and like Hirschhorn now hosts a hotel and restaurant. The Neckartal is a great Sunday drive. The length of the drive from Heidelberg to Heilbronn is about fifty miles, and with regular breaks among the towns it can easily fill a day. You have to be careful, too, because the way that the Neckar River bends and twists, some of the best sights wind up appearing behind you! So, pull out the map, and go for a ride! You'll really appreciate it.